Folding screens are a traditional form of art that was popular in Asia in the 19th and 20th centuries. The paneled artworks featuring paintings, patterns and calligraphy were used to decorate rooms, to highlight the presence of a powerful figure or as a backdrop for various ceremonies and rituals. The Amorepacific Museum of Art’s “Beyond Folding Screens” is a large-scale exhibition that brings the folding screen to the fore. The exhibition features 76 folding screens, including many produced during the Joseon period as well as some from Korea’s modern era. 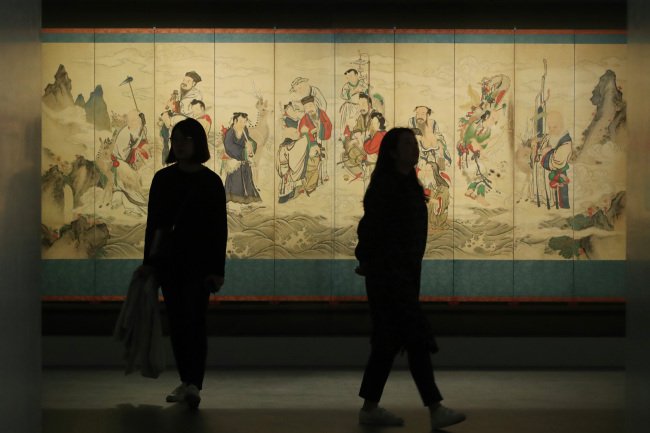 “Korea’s production of folding screens was very active during the Joseon era, but they have hardly been introduced abroad, whereas those from China and Japan were exported and beloved by people from the West,” curator Pyun Ji-hye told the Korea Herald. The works on display, produced by court painters as well as individuals, come from the museum’s collection and private collectors as well as 10 other institutions, including the National Museum of Korea, the National Palace Museum of Korea, the National Folk Museum of Korea and Leeum, Samsung Museum of Art. The first work on view is a 10-panel folding screen bearing the image of Geumgangsan, whose sheer size awes the viewers. This is followed by “Taoist Immortals Crossing the Sea.” King Gojong presented the 10-panel folding painting to Carl Andreas Wolter, a German co-founder of Korea’s first trading company, upon his return to his home country. The next section is dedicated to folding screens produced in the royal court, including “The Sun, Moon and Five Peaks,” which was placed behind the king’s throne as an emblem of the royal authority of a king during the Joseon period. “Korean folding screens first started in the royal court then later spread to the civilian sector. They were used to decorate various court ceremonies, banquets and rituals,” Pyun said. “Like how we take pictures when we travel, the people from the court also painted royal occasions on the folding screens and shared them with the participants. The finest work was presented to the sovereign. The sections that followed included folding screens featuring “minhwa,” or folk paintings, and works by modern artists. 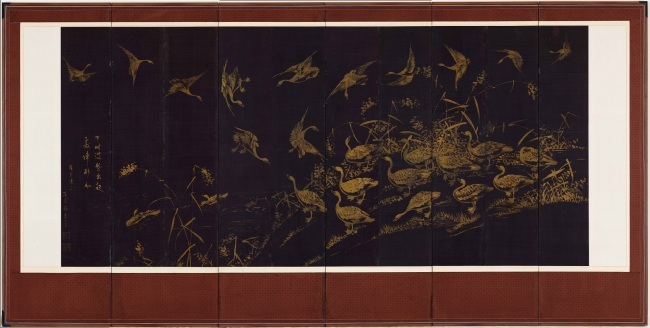 Late 19th-century court painter Yang Gi-hun’s “Geese and Reeds,” painted in gold paint on black silk, and court painter Yi Han-cheol’s “Fish and Crab” are other noteworthy works. 20th-century Korean painter Kim Ki-chang’s “Haenyeo,” featuring the famous female divers of Jeju Island, is also on show. The exhibition “Beyond Folding Screens” runs through Dec. 23.